boy couldn't stop playing toys until he got the story out of his head. Then the story becomes a dream. In the end the prince wins the princess's heart. The boy dances with the girl. One day a boy had a crush on a girl. His name was Timothy, her name was Sammy. It was a cold raining morning in February and the boy had a thought in his head. This thought was will I or will I not ask Sammy to the school dance? As he stepped on to the icy pavement he knew the answer. Yes, today I will ask Sammy out whether or not she rejects me. And as he stepped twice a second thought emerged: I will go to that dance whether or not I have a dance partner. He pumped his right fist with indignation and walked his way to school after saying goodbye to his mom. He was eight years old and in third grade at St. Adalbert school. St. Adalbert of Prague had five brothers and was a well educated man. He became a priest then the bishop of Prague. In his later years he became a missionary in Prussia, but Adalbert was martyred in April 997 for not staying away from the sacred oak groves. As he walked through the crowds of students, even some late teachers, he made his way into the building. As he opened the door he felt the warm presence of his peers, even though he was late, but not Sammy, no, no sign of her, he wondered if she would show up; but there she was a moment later wearing her pink coat and purple scarf. “There's my princess,” he said to himself. He waited for Sammy to put away her winter weather apparel and to sit down, then he approached her. “Hi,” he said with his back foot waging like a short dog's tail. “Hi,” she said in return with her famous tooth gapped grin, which did little to hamper her beauty. Timothy took a deep breath and opened his right hand all the way, he said: “Sammy, will you go to the dance with me?” His tone was nervous. “I would but I'm going with someone else, sorry,” she said. “Oh, well I could go with someone different then,” he said. “Your place sounds nice,” she said sweetly then giggled. What a prince, she thought, he's almost as cute as Carl, the one who is my dance partner. “So its a date?” Timothy said. “Sure,” Sammy said shyly then laughed as she was blushing. Right on! Timothy thought. Maybe I can get her to change her mind and be my dance partner after all! It was a thrilling morning and afternoon at school for both Timothy and Sammy. They both waited expectantly for their date together, which they thought would be splendid. As the day at school went on Timothy gave his address and phone number to Sammy, and she accepted it with joy. They studied math, reading, social studies and science and had the homework to plan for a religion test. After school and in the car drive home, Timothy and Sammy told their parents about the date, but they didn't actually call it a date, just that they were meeting a new friend after school, and to Sammy it was just a school kid, trying to get away without mentioning he was a boy because she knew her father would say no. Then there was a phone call. Sammy's mom called Timothy's mom to set up the date at 4:00 pm, that's when Sammy's mom discovered her daughter's new friend was a boy, but, Timothy's mom explained it was just a innocent friendship, then they both laughed quietly about it to end their conversation. It was February 26 with a blizzard outside when Sammy arrived at Timothy's house. His house was across Comstock Park by the river. They pulled up in a red colored car, shiny, it looked to be two years old only, quite new. Then there was a short knock on the door followed by a ringing door bell. Sammy was in her pink coat and purple scarf with a warm smile on her face as the door was opened to her. She wanted to get inside, it was freezing! But there was something else that was cold, Sammy didn't expect it. It was the face of the man that opened the door. He wore a Detroit Lions cap, maybe he was a football fan like herself, she wasn't sure. So...Sammy smiled even harder and even spun around on one foot and by the time she landed on both feet the cold faced man was smiling warmly with Sammy. No one can resist my gapped tooth smile, Sammy thought pleasantly. “Well sure I am,” Roy said. Then he turned his head and called for Timothy to come down stairs and he let Sammy come in so she wouldn't have to wait in the cold. Sammy brushed herself off and stomped her boots to get the snow off while a lady said hi to her. “Yes dear, that was so cute,” Mary said, then she hummed a laugh. But Sammy was serious, the Green Bay Packers and Detroit Lions are bitter rivals indeed. “Suppose they play each other, you have to decide between them then,” Sammy said. “So you see it my way then Sammy?” He said. More like stubborn, Timothy thought, but I still like her. Sammy thought, I was being silly like my mom, that's good Timothy corrected me. As they reached the top of the staircase, Sammy smiled at Timothy and he grabbed her hand leading her to a room. The room he led her to was one of four upstairs rooms and across from the bathroom. Timothy pointed to a building block dragon on the ground, then he turned around to look at Sammy. “Me and my dad play video games and, toys, but my mom, she only plays on her tablet. “I'm not much of a gamer,” Sammy said, with her hands in her pockets, she wasn't very excited. “Well if you don't play video games check out my toys, Timothy said excitedly, with his right hand open as a gesture to two large tubs. Timothy and Sammy walked over to the right-side corner of the room, then they both knelt down together and opened one of the plastic tubs, very excitedly. It had an assortment of toys inside, from soldiers, to giants and ninja's, but no dolls or teddy bears that Sammy was hoping for. “Oh no,” he said, “my mom just plays with my toys, so does my dad. “Oh, its when we each ram two cars together and the last one standing wins, but the car that tips over loses,” he said. “But what if both cars tip over Timothy?” She said. So they played bumper cars, and in the hallway, since the cars' wheels rolled better on solid wood than carpet. The game was the best out of three and Timothy had the advantage because his racer car was lower to the ground than Sammy's pink truck, and even, since Timothy's arm was stronger. “So that's it Sammy, no more?” He said. “So what do you want to do now,” he said. “How about we play a game where we're on the same side, not against each other Timothy?” She said. So they went back into the play room and sat around the building block dragon while Timothy opened a medium-sized container and brought it with him so they could play. Once Timothy emptied the contents of the tub, they saw the pieces, from building block people, to blocks, wheels and lights, even swords and shields. Timothy thought, the bible says, if you have faith and do not doubt, you can say to this mountain, go, throw yourself into the sea, and it will be done, and the bible also says, Truly, truly, I say to you, if you ask the father for anything in my name, He will give it to you. So while Timothy waited for a response from Sammy he prayed, Father I ask you in Jesus name and I don't doubt, please give me a dance with Sammy, Amen. “I like it so far Timothy,” Sammy interrupted his speech. “We were having such a good story.” And Mary thought it was the cutest thing in the world. Timothy placed the treats on the computer desk next to the dragon while he listened to his mom. “Now finish your cookies and milk, you two, and I'll be right back with pillows and blankets for nap-time.” Mary said. So Timothy and Sammy drank and ate their treats while they talked about the story. “So what happens next when we're riding the flying dragon Timothy?” Sammy said. Then Timothy laid down next to Sammy and said, “wait and see, I'll show you soon, but first its nap-time.” So both kids rested comfortably under the blankets and laid their heads on the smooth pillows, and they fell fast asleep. “Sammy relax your nerves,” he said, “we're suppose to be celebrating our engagement, remember. “Right,” she said, and as a sign she calmed down, Sammy grabbed Timothy's waist to hold on, she was still scared for her life. “Okay, okay,” he said and thought, there are no reins or controls to land this dragon. “Hurry Timothy, we're running out of land.” And by the time she said that they were above the deep-blue ocean. Oh I know, Timothy thought, the dragon must follow voice commands. “Land beast, land,” he said in a commanding voice. “But no! We'll crash in the ocean,” Sammy said. “She's right,” Timothy said, “turn back before its too late. “We shall see,” the dragon roared, “stop your complaining.” And with that the dragon flapped its wings harder across the ocean. “Oh, no!” Sammy said, she felt lighthearted as if she would faint. And before they knew it the dragon was falling. There was a large splash and the dragon was belly-up. Would the kids drown? Gorfeenda thought. Then amazingly the dragon regained some strength in her wings, and flipped top-side-up. Oh my, the dragon thought, my wings are still to weak to fly but at least I can move them now, but what about the kids, are they alright? Coughing and hacking is what Gorfeenda heard next and a sign the children were still alive. The dragon was well pleased. But then Gorfeenda heard complaining which roused her anger, but she was patient with the kids. Timothy and Sammy both finished coughing and said and agreed if they stayed under water any longer they would have drowned. Sammy felt cold and she was wet. She thought, my princess outfit is soaked, I hope its not ruined. If I'm to marry Timothy I better get to know him first. Timothy was shivering but confident. The journey has almost begun, he thought. “How did you know I was going west?” Gorfeenda said. “Because I made this story, I know what could and should happen,” Timothy said. Gorfeenda was in a uproar at that response, she whacked her tail, stinging it against the tide. The dragon thought, I know he's lying, I'll prove he's a magician one way or another, but in the mean-time I'll be patient. So the journey began and Gorfeenda turned westward while raising her front two wings as sails and using her back wings to steer. As the three traveled they realized they couldn't drink the water because it was salty, but at least the dragon caught some fresh fish, however, Sammy and Timothy weren't comfortable eating raw sea life, but they had no choice, it was two days since they last ate. Then Timothy continued, “You see, Sammy, this story I made up is all about overcoming sin and spreading the good news of Jesus Christ. I learned if you can give up one thing you love for Lent, then you can find the strength and courage to repent from sin as well. Gorfeenda disagreed in silence that this was Timothy's story, made up, and that it was a dream, however, she agreed you should repent from sin and give something up if that would help, but, the dragon never heard of Jesus Christ before or Lent and was interested. When they first saw land upon the western shores the dragon hoped to be done swimming and Sammy and Timothy hoped for cooked food, but all-in-all, they hoped for something to drink, for they were dying of thirst. And before they knew it the dragon's toes touched the sea floor and the claws of her left hand dug into the rich soiled bottom. Then there was a thump, thump...thump, thump and Timothy and Sammy were rocking up and down to indicate Gorfeenda was walking. The dragon was worried something like a crab might bite her feet, but, the children were content to be safe from dangers below. The kids looked back to see Gorfeenda's tail free in the air with a playful mood. Next, an hour later, since the shallow water was long, they finally reached the shore. The kids and the dragon were happy to be free from the sea, so they took a short rest, and as Gorfeenda sat down the children loosened their restraints and climbed down her wing, which was still weak, to reach the ground. 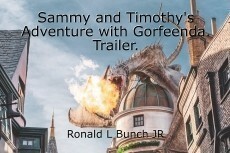 Sammy and Timothy stretched out their limbs for being in a seat for so long, and when the dragon stretched out, she looked so majestic standing on her hind legs. Sammy was in a very playful mood. Suddenly—she started running, and through Gorfeenda's legs, then around and around until the dragon lost balance and fell—she was laughing. But Sammy didn't get far, for she had on a dress and it allowed little running room. When Timothy caught up to her, he knocked her down, then they were both laughing. After this short and playful jaunt, Timothy and Sammy shared a kiss when the dragon arrived, and that was their first smooch. Timothy picked up Sammy's hand, kissed it, then helped her up. The kids were startled when a black shadow came over them, it was the dragon standing more than twenty-feet tall. “Yes,” Sammy said in agreement. And the dragon only nodded, holding back her wrath which was one of the seven deadly sins, because the children were fooling around in what she believed was a life or death situation. Gorfeenda and Sammy were lost, but, Timothy was sure he knew the way, he said, “follow me through this path, it leads to a clearing where we will find what we're looking for. So they followed Timothy into the wooded path where they were shielded from the March winds for now. The trees arched over covering the top of the path. It was partially dark and gloomy. The dragon had to walk on all fours to avoid being mingled in the trees. The group was scared, it was quiet, and you could only hear the foot steps and breathing of the party. “Gorfeenda make a torch,” Timothy said. The dragon nodded in compliance and made a torch with her fire breath. She handed the torch to Timothy who was still leading the party. Sammy wasn't sure of what to think, but she was scared. The dragon was on guard watching the path and the flickering flame of the torch. Sammy started to panic in fear, especially, when two spiders the size of her head slid down from the trees on webbing. The spiders appeared behind Timothy, one in front of Sammy, and the other one on the dragon. Gorfeenda quickly shook the spider off then stepped on it, while Sammy was told by Timothy to draw her sword, but she complained it was a ceremonial blade, only, and not made for fighting. She drew the sword anyway and stabbed cleanly through the spider with more force than she knew she had. Timothy was proud of Sammy and the dragon, and he was glad he didn't have to draw his own sword. There was only a short resting calm between the party, because, before they knew it more spiders appeared, and so many, and different sizes, either crawling at their feet or zipping down a web, that they had no choice but to run. Sammy felt worse than being on a flying dragon. There was a large web blocking their path, so Gorfeenda blew her fire breath at it and it burned. The party didn't have enough time to wait for the fire to burn out, so they ran through the blazing hole it made. When Sammy's dress caught on fire a spider the size of the dragon found the running party. As Timothy stomped-out the flame on the back of Sammy's dress, Gorfeenda made short work of the enormous spider by spewing a large fireball. Timothy and Sammy were tired and they could run no longer while the dragon was glad the spiders stopped chasing. They continued their journey walking for the next thirty-five-minutes, and during this course of time they heard hissing and growling sounds. “We must be in the catmen territory, but don't worry, there afraid of us as much as we are of them.” Timothy said. “Next is the lionmen, and Gorfeenda, I have a favor to ask of you, please let us ride on your back for these lionmen are much too dangerous. The dragon nodded in agreement. “You must run swiftly my friend,” Timothy said. So Gorfeenda laid down and the kids got on her back, in seats, with the order of Sammy first then Timothy last. The dragon didn't waste anymore energy and started running right away. She ran for a solid forty-minutes, but, there were dangers along the way. Timothy and Sammy drew their swords and whenever a lionman jumped at the dragon, whose scales were too strong to bite through by-the-way, they would swing their blades cutting them off; and there was one stubborn lionman who held on to Gorfeenda's tail for a whole five-minutes; Timothy had to take off his seat belt and crawl over to cut him off. Then they finally reached their destination which was a safe-zone and a clearing with a log cabin for a house. Timothy and Sammy told her the whole story so far, and that they needed, shelter, food, and water. “Yes that is right, and nice to meet you, we are Timothy and Sammy, a prince and princess.” Timothy said, and tried to shake her hand, but she moved away. Timothy leaned forward and laid hands on her. “In Jesus name be healed,” he said. The woman started to feel wonderful again and giddy, she was laughing, and her boys coming home could hear her through an open window a breeze blew open. “This is a sign that follows them that believe in Jesus Christ. In his name they shall lay hands on the sick and they shall recover.” Timothy said. “I'm healed!” Minnie said, just when her boys came in and a bird was listening and watching the whole time. “Who is Jesus Christ?” Minnie said. Sammy explained who Jesus Christ is, “that he is part of the Holy Trinity who is the one and true God, and that he came to save souls, and your soul Minnie, and your boys can be saved if you believe on Jesus Christ and accept him as lord and savior. “I believe.” The boys and Minnie spoke as one. The bird quickly told the message of what happened, for birds don't take miracles lightly. Gorfeenda who was outside learned what happened and other birds plus people in minutes and the message spread like wildfire all over the kingdoms and even Hidden Gale City which is a floating land. It was a merry cabin with deer meat cooking inside. Minnie and the boys fed the party and gave them drinks of water from the well—and moments later—the dragon spread her wings with joy to find them strong for flying once again. “Okay my princess!” Timothy said delightfully. to Minnie and her boys and they waved back. Blasting north-east and an eight hour flight, Gorfeenda, Timothy, and Sammy flew to Hidden Gale City. lighting The Way and the Great Stair. The Way was a brick road with dragons pulling carriages and passers-by; it led to a very long and steep set of steps called the Great Stair. As the party walked along The Way citizens and soldiers cheered for them: Hooray! Our prince and princess are safe, hooray! Sammy told a soldier what happened to them, then he said, he will notify the Steward of Hidden Gale City at once. Timothy talked along The Way and the Great Stair. He said, “there are still trials ahead for us. Gorfeenda, you did a good job of overcoming wrath by controlling your anger and being patient with us and you overcame sloth by avoiding physical laziness, but, you still have five deadly sins to overcome. And Sammy our trial is to preach about Jesus Christ despite who might not like it. When they finally reached the city area by walking along The Way and the Great Stair, they realized they haven't slept for three days, and a soldier by order of the Steward of Hidden Gale City, led them to a palace where they would have furnished rooms and a royal barn for the dragon to sleep in. After the party slept the Steward of Hidden Gale City greeted them, he said he has rewards for Gorfeenda. She agreed to go, but would only eat a little. The dragon overcame gluttony. “No,” the dragon declined and overcame lust. She also overcame envy and pride over the other dragons in the breeding grounds. There are two more things I have to offer you Gorfeenda, one, will you take this large sum of gold as a reward?” The Steward of Hidden Gale City held out his hands with shimmering gold. Gorfeenda came over the last of the seven deadly sins, greed. “Yes, of course,” Timothy said and Sammy nodded in agreement. Three hours later the party met inside a large tent, Timothy and Sammy didn't sit in seats of honor because that was reserved for Gorfeenda. About a hundred people showed up for the feast and they gave cheer to the dragon, they ate pizza with milk and wine, and salad with chicken wings. After the meal the Steward of Hidden Gale City announced Timothy's and Sammy's wedding to be at 1:00 in the afternoon outside the palace, two hours from now. The dragon met with Timothy and told him to ride on her back, so he did. Gorfeenda traveled into the city for thirty-minutes, they ended up at a magician's shop. The dragon told Timothy to get down and take the test, to see if he's a real magician. So Timothy got down and went inside. The test only cost a small amount of gold. He was told to read various tomes and try to cast the spells, from novice to master, but Timothy failed at every attempt. The shop owner told Gorfeenda, who was waiting outside, that Timothy was no magician and that his ability to predict the future and heal the sick must come from another source, maybe his God. The dragon was astonished and believed his claims about Jesus Christ was true. In an hour and thirty-minutes later the wedding was about to start. Timothy was dressed for the wedding and came with the priest and best man who was one of Minnie's boys, they waited at the altar. The groomsmen and bridesmaids came next in pairs. When Sammy came down the aisle with her father music started, a very calming and cheerful song with piano and stringed instruments. Then Gorfeenda came down the aisle as the ring bearer. When the priest started speaking, Timothy, Sammy, and Gorfeenda had a change of heart; and when the priest got to the vows it became even worse, especially the part about Sammy having to wear a chastity belt until she is eighteen. So Gorfeenda laid down and the children quickly sat on her back, in seats, and they flew off knowing they made the right choice, that weddings are not for children, but, the Steward of Hidden Gale City and his royal guard threw fireballs and lightning at Gorfeenda in an attempt to stop their escape, but failed. The party was chased by dragon riders, but, they wouldn't dare follow them to Minnie's house, for that was near the Forbidden Forest where many dangers lie you know of. It was the party's plan to live with Minnie and her boys, while at times, secretly, going on jaunts to various kingdoms to preach about Jesus Christ (which was now more dangerous than ever) and heal the sick. In the mean-time Hidden Gale City would try other attempts to make the warring kingdoms have peace, until Sammy and Timothy become eighteen and old enough for a wedding. Timothy and Sammy woke up from the dream under blankets and smooth pillows. Nap-time was over. Timothy and Sammy talked about the dream they shared together. “The story went almost exactly as I had planned for the building block toys, except in the end we got married, but in the dream we had a change of heart and we were not married,” he said. “I agree with you Sammy,” he said. Then they started thinking of marriage in real life, and they bonded. “Okay,” she agreed. So they danced in the playroom until it was time for Sammy to leave. A truly magical fantasy,well done Ronald. Awwwwwww, this was just too cute and sweet. I love how well the fantasy theme played a role in their relationship together. This is a very sweet story. Your descriptions were very good! Wonderful job! What is that nois Fred?